Everyone is guaranteed a part in a registered production. At actOUT! a registered production means we accept enrollment until a total number of performers are found or until casting rehearsals are complete. First come--First served. There is no requirement for an audition before rehearsals. 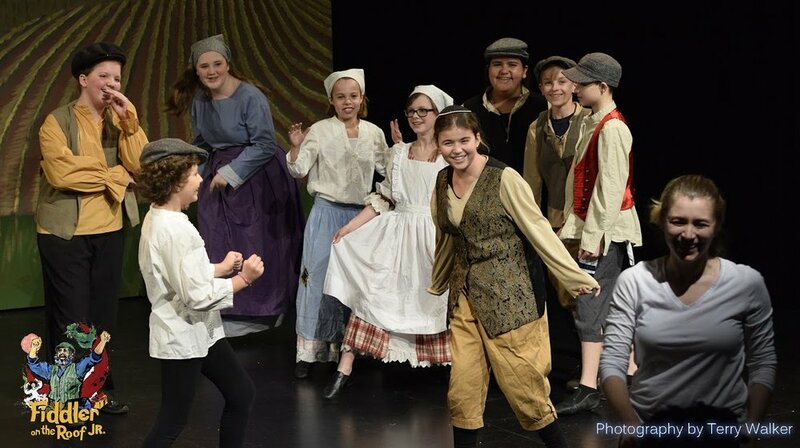 Some of the cast of 2017's Fiddler on the Roof Jr. The acting company spends the first few rehearsals working together as a team. The ensemble cast does character building, movement work,vocal exercises and script read throughs long before we begin to cast. First and foremost, actOUT! is a teaching theatre. We maximize stage time for the performers by providing opportunities to portray multiple roles. 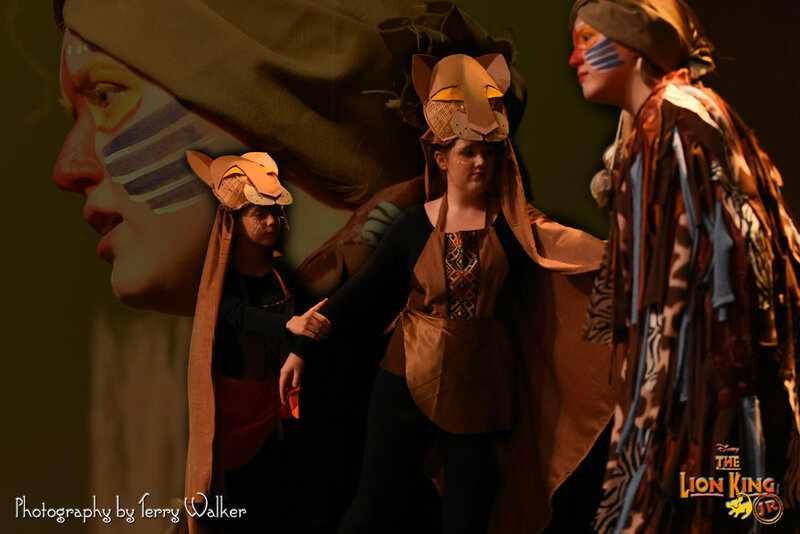 Production picture from 2018's June Musical Lion King Jr.
We double cast our shows giving greater opportunity to the company. What this means is that from our company of actors we will create two different castings of the show. This gives us an opportunity for performers to play multiple roles in a production to encourage them to learn. Each version of the play will perform several times in production weeks. The actOUT! double-casting system also allows each actor to have a partner playing the same role to compare notes, to assist in lines to assist in development etc. Peer mentorship is a foundation of the actOUT! rehearsal culture. Please note: We don't double cast our Mini-kids productions (this proves too difficult for the very young casts). We build a full team effort! The 2018-2019 season will offer a number of opportunities and challenges for our young company of actors, from mini-kids producitons to full scale musicals. At actOUT! an 'auditioned production' indicates that hopeful participants will go through an audition process and may or may not be cast in the show. Our 'Advanced Actors' productions present slightly more difficult material and creates a greater challenge in the rehearsal process. Participants are often expected to have experienced theatre and drama work before and will be more familiar with working on the stage. First timers are welcomed and encouraged to audition. Since actOUT! is often the first time for many participants going through the audition process we try to minimize the stress. We try to make the stress of the audition a learning experience to be cherished, rather than a challenge to be overcome and forgotten. We try to give positive feedback to all who audition. Each Advanced Actors production is different. When an actor signs up for an audition they will be sent audition requirements and information to prepare for the audition day. The expected age range for Advanced Actors is 13-18. Younger actors may audition with the permission of the Artistic Director, however, please note that often the material of an Advanced Actors production may have slightly more mature themes and parental discretion is advised. The 2018-2019 season will offer a play with an unbroken storyline and presenting the full cast with complete stage time (Actors seldom, if ever, leave the stage). Sure to be a gripping character driven piece this will be a strong choice for any performer.